We are finally into the most awaited week of the year for all the trailblazers around the world. The Salesforce Ohana is all geared up for four days of innovation, learning, giving back and fun. Dreamforce ’18 is going to be the biggest Dreamforce ever and we are expecting more than 200,000 attendees to join the event. With over 3200 sessions scheduled and hundreds of companies exhibiting their products at customer success expo, the footprint is going to be huge. Our team will be at Dreamforce again this year and we’re leading our strongest contingent for DF’18 with our leadership team driving the way. 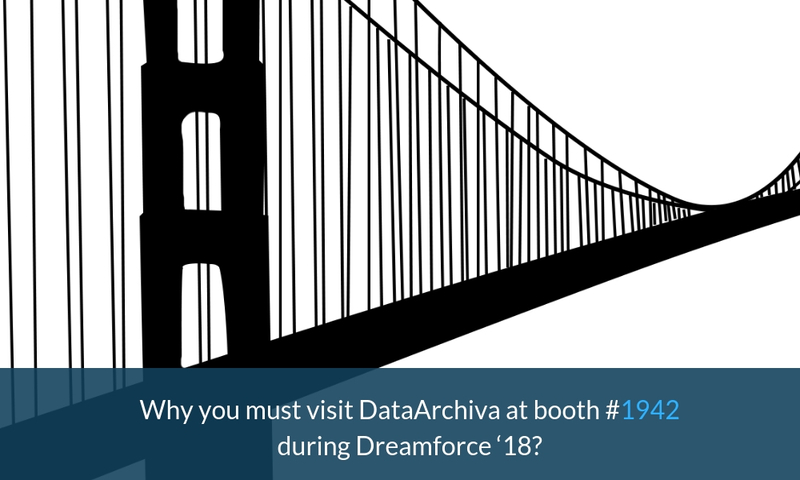 As an AppExchange ISV Partner, we are showcasing our flagship product DataArchiva during the event and here are few reasons why you must come and see this amazing product which can save you up to 80% data storage cost. DataArchiva is a 100% Salesforce native data archiving solution which will periodically archive your infrequently used Salesforce data. As DataArchiva is a native application (*the only native application till date), your data will not go out of your Salesforce Org and it will be as secured as it was before. So, if you are looking for a data archiving solution, you must visit us at our booth #1942 during the event. DataArchiva will not only archive your infrequently used Salesforce data, but it will also potentially save you over 80% of data storage cost. As additional Salesforce storage space is highly expensive, you can opt for DataArchiva in order to archive your data with a significant cost reduction. If you want to know how, ask us at our booth #1942 during Dreamforce. If you are dealing with health care, financial or government data; retaining your data is a must to meet compliance regulations. DataArchiva is your go-to solution as the application will help you save your sensitive business data securely and retain data for a long period of time. Moreover, DataArchiva is designed to work with US Government Cloud, which enables the solution to serve any Government agency. So, if you are a healthcare, financial, or Government service provider; you must visit our team of experts to understand more. At times data overloading results in too much time-consuming in assessing the required data. With the help of DataArchiva, you can archive your less accessed data which will speed up the overall application efficiency and performance. You can join us at our booth #1942 to take an easy quiz based on your basic Salesforce knowledge and win exciting prizes. You can also take part in our online “DF’18 Wheel of Fortune” contest and can win amazing DataArchiva offers and goodies. In the journey of your digital transformation, we can help you strengthen your bottomline to optimize your business top line. As a Salesforce techno-focused solution and consulting service provider offering world-class enterprise solutions to multiple industries, we have served over 150 customers across the globe. With over 10 years of technical expertise and more than 80 percent of certified Salesforce professionals, we offer an agile and collaborative approach to build customized solutions across the digital value chain. We are specialized in offering Salesforce Lightning and Einstein Analytics services in addition to our enterprise products. See you at booth #1942. Enjoy your Dreamforce ! !